Sussex's Luke Wells scored an unbeaten 98 to defy Durham on day two of the Specsavers County Championship Division Two clash at Emirates Riverside. The home side appeared to have taken control of the contest after James Weighell and Chris Rushworth combined to reduce Sussex to 71-7. However, Wells led a rearguard action with the tail, adding 131 for the final three wickets to frustrate Durham, although he fell agonisingly short of a deserved century. Ollie Robinson struck early in Durham's second innings, but Alex Lees and Cameron Bancroft were unbeaten at the close, leaving the north-east outfit 53 runs ahead going into day three. Wells said afterwards: 'Obviously it's very pleasing to score runs when they really matter. It was difficult for us out there, they bowled well with the new ball. They have some skillful operators, who we've seen before. It was nice to keep us in the game. 'I don't think anyone has got a big score at this ground without having luck at some point. Everyone knows that it does do a lot for the bowlers up here. Nearly running myself out was not very smart. Durham began the day on 210-8, but were quickly dismissed after adding only 14 to their overnight total. David Wiese and Robinson removed Ben Raine and Rushworth respectively. In response, Rushworth made inroads into the Sussex batting order in his first over as Phil Salt played a loose drive to fall for two. Wells was fortunate not to be run out by Raine, who missed the stumps with a throw from 10 yards. Raine did atone for his miss, striking to dismiss Tom Haines for 22. Weighell took control before lunch, finding a rhythm from the Finchale End. He notched the crucial scalp of Stiaan van Zyl, who edged to Bancroft at second slip. Laurie Evans and Ben Brown soon followed, leaving the visitors reeling at 62-5 at lunch. Matters did not improve after the interval for Sussex. Rushworth replaced Weighell, and enjoyed the same success as his team-mate. He bowled Matthew Burgess for nine before removing David Wiese's off-stump. 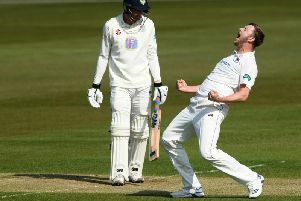 Amid the chaos at the other end, Wells maintained his vigil after previously surviving when he edged the ball between Jack Burnham and Bancroft in the slip cordon. He made the most of his opportunity, building a vital partnership with Chris Jordan to stem the tide. The 28-year-old made his fifty from 122 deliveries, scoring seven boundaries. The partnership was broken on 48 when Jordan drilled a Gareth Harte delivery at Raine. Wells stayed home, forcing his partner to turn back halfway down the track. The throw from Raine was good enough for Ned Eckersley to run out Jordan for 25. Wells kept the visitors' resistance alive, forming another stand with Robinson to thwart the Durham attack. The left-hander began to pierce the field to find the boundary with regularity, whittling down the deficit. Robinson made a solid 14 before he was bowled by Matt Salisbury, leaving Wells with the last man Mir Hamza. Hamza held his own to allow Wells to open his arms to bring Sussex within 29 runs of the home side's total at the tea break. Wells look poised to notch his fifth century against Durham, but Hamza's defences gave way to Rushworth after 57 minutes at the crease, leaving his team-mate two runs shy of three figures. Durham began their second innings with a lead of 22, only to be immediately pegged back when Robinson trapped Steel lbw for a duck. Lees and Bancroft were able to drop anchor in the remaining overs before the close as the hosts ended the day 31-1, 53 runs head of Sussex.